“A chain is only as strong as its weakest link” the saying goes and when it comes to protecting the inside of your home from the temperatures outside, the windows are most often the weakest link. But replacing a homes windows is a major investment, and in many cases either not cost effective or simply unaffordable. However there are several steps that can be taken to increase the efficiency of one’s windows without spending a lot of money. Before taking any action on a homes windows, one first needs to determine what type of windows their home has as this will determine if a homeowner should seriously consider replacing their home’s windows or not. Windows, in general, come in two types: Single pane and Multi-pane and there is a dramatic difference in energy efficiency between the two. Single pane windows are windows where the inside and outside of your home are separated by only a single sheet of glass, most often set in a wood or aluminum frame. 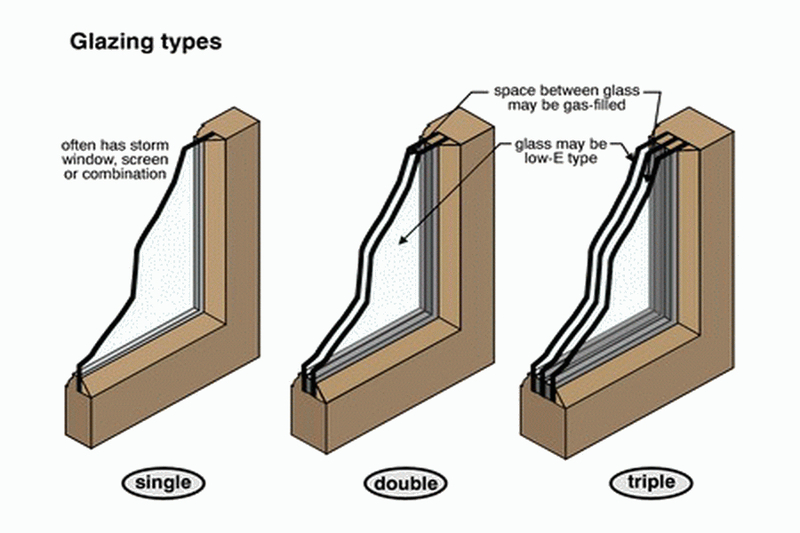 These single pane windows are extremely inefficient, even if properly installed and well maintained, due to that single pane of glass being a good conductor of heat into and out of the home. Single pane windows make a much more difficult for you to keep your home warm in the winter and cool in the summer. If you have single pane windows it will almost always be worth considering replacing them with new and efficient double or triple-pane windows and often financing assistance will be available through your local utility. If, however, your home has double-pane windows already it will likely not be cost-effective to replace them. New windows are expensive, and the efficiency gains between old double-pane windows and new double or triple-pane windows is not nearly so dramatic as to justify the cost of installation, with the payoff likely running over 10 years. There are several steps you can take to make your windows more efficient, regardless of if they are single pane or multi-pane. The most expensive, though far less expensive than the installation of all new windows, of these options is the installation of removable storm windows to the interior or exterior of your home. This will provide you with many of the benefits of having multi-pane windows, as it provides a layer of insulating air between the interior window and the exterior window. Storm windows can be especially useful to those who are restoring an older home and with to maintain the historic character of its wooden windows while avoiding some of the disadvantages. A far cheaper option to storm windows that will achieve many of the same effects is to cover your windows with plastic film during the winter. Like with storm windows, this traps a layer of insulating air between the outside and inside, greatly restricting heat loss. Windows are also a source of air leaks and, due either to improper installation or wear and tear over time, will eventually develop gaps. If you are able to feel drafts coming from around your windows, they should be recaulked. If there is a draft coming through the window frame itself, it may also be helpful to seal the windows during the winter when they will not be opened.